Creates a natural radiant result. 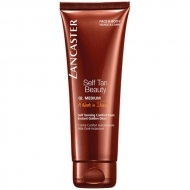 Self-Tan Beauty - Melting Delight is a Lancaster self-tanner to give immediate radiance to skin. This fondant texture was developed with Tan Color Adapt Technology that combines a melanin-enriched agent to copy the natural tan. 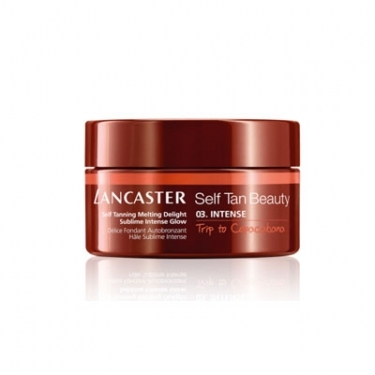 It stimulates the synthesis of melanin in the skin to improve radiance and skin's natural luminosity. Coconut water provides a exfoliating and moisturizing action to improve the tone and promote a even-looking sun-kissed complexion. It helps protect the skin from oxidative damage caused by sun exposure. Lightly scented with an addictive that leads for that takes you for a holiday dream. Firstly apply to legs and arms. Then spread all over the body. To get an even flawless tone concentrate on dry rough areas like feet, hands, knees, and elbows.